Mark this day! Today, I will be sharing a review on my top BB cream to date! Long time AMW readers would know how much I love my Skin 79 VIP Gold BB Cream and I finished up 3 huge bottles of it and I am currently on my 4th and last bottle! As I was juggling my brain on what to do next since I don't have stocks left for my favorite BB Cream, look what I've found! The newest BB Cream that I love and seriously can't believe it jumped up to AMW's No. 1 BB Cream spot! Based from research, Fairydrops Candy Bar BB Cream is a Japanese brand produced by Mayumi Yasutomo, a newscaster, who desired to have a product that will make her skin looks flawless on camera! Makes skin look flawless even while on camera with 5 treatment essences. 5 kinds of treatment essence to moisturize and for healthy glowing skin: Hydrolyzed Collagen, Squalane, Sodium Hyaluronate, Jojoba Seed Oil and Panthenol. Oil-free, waterproof and lightweight formula. Has micro-gold pearls that hide scars and freckles, diffuses light to hide wrinkles and smoothens and softens skin. No SPF. SPF gives off a white cast when one is photographed. Doesn't look flat on skin. Super cute and unique BB Cream packaging. The sponge that comes with it makes it easy to apply during travel. The formulation is very light. Gives a good coverage without white cast. It covered the red spots on my face and minimized the darkness of my under eye circles. I can get away with using only this product and set with a powder. My skin looks flawless and clean for the whole day no matter how busy I was running errands. Lacks SPF (as compared to other pricey BB Creams) but I guess it's a huge reason why this BB Cream doesn't create white cast on flash photography. The Fairydrops Candy Bar BB Cream has a good amount of coverage, it can cover a bit of my under eye darkness and redness. The product is lightweight and can last the whole day with very minimal retouch. Light Ochre is best used if you are MAC NC20-25. Ochre is a ta bit darker. If you really LOVE to try this BB Cream but think both shades available won't match, you can always adjust the shade by using a darker or lighter powder foundation to "set" the BB Cream. For fuller coverage, use the sponge application and apply it in a quick, patting motion. For quick application, squeeze out the product at the back of your hand and apply using your fingers or foundation brush. Wash the sponge regularly to prevent bacteria buildup. For lesser makeup application finish off by concealing areas that needs to be concealed and set with powder Lesser amount of makeup applied will let our skin breathe. Apply face sunblock prior to BB Cream application. Skip sunblock application if you will be photographed on that day. Very dry skin individuals needs to apply more moisturizer on dry areas prior to BB Cream application. For very oily skinned individuals, a good oil-control primer may still be needed underneath. Once signs of irritations occur, STOP product usage. Normal, combination, dry or oily skinned individuals. Available in all Beauty Bar stores for Php1,550.00 (approx $37.00). LIKE FairyDrops Philippines on Facebook for more product updates. Everything was written in Japanese but good thing ingredients list are in English. comes in a squeeze-type tube with detachable sponge applicator. This gives a nice control on the amount of product you need. Some people prefer to squeeze a good amount of product at the back of the hand and dab on the sponge for an even application. While others may prefer to squeeze the BB Cream directly while sponge applicator is attached. It all boils down to your personal preference. I like applying this BB Cream with a quick dabbing motion then gently blend out "obvious" edges with clean fingers. Right side (facing you): no makeup at all. Left photo: Clean face without a trace of makeup. 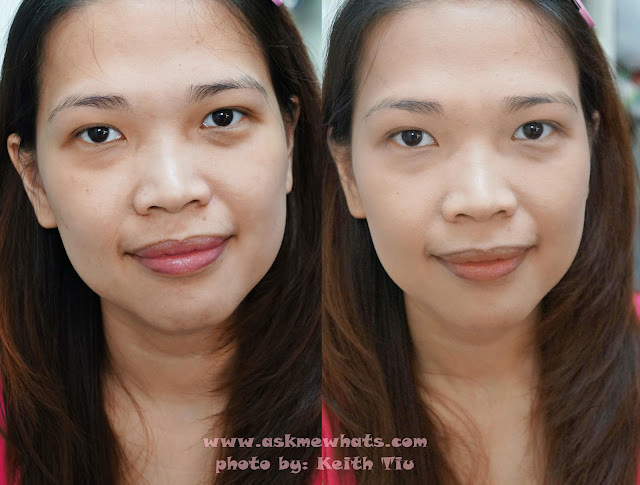 Right photo: With Fairydrops Candy Bar BB Cream in Light Ochre applied moderately. Observations: Check how the darkness under the eye were lightened and my face looks more even as the redness around the cheeks and chin were completely covered. I am using Light Ochre shade which works so well on MAC NC20-25 skin. Ochre would probably go well for MAC NC30-35. Have you tried Fairydrops Candy Bar BB Cream or other Japanese made BB Creams? What are your experience? Do you like Korean or Japanese BB Creams? Ay for sure! Malulula ka! Kahit sa Akihabara which is supposed to be for electronic/anime stuff, magulat ka they have makeup din ! :D Enjoy your trip! My pleasure, I've read raves about this product too and I'm glad it worked for me! Sis April, thanks for the concern! Yup, I do know I need all the sleep I can get but it must be the pregnancy hormones. I have a hard time sleeping since I got pregnant! No matter how early I get to bed, I have this discomfort that makes it super difficult to sleep! But I do take naps! Thanks! I gotta try that Fairy Drops. That looks cute and looks effective on you. Hi Cherise, you can give their testers a test and see which color suits you! Fantastic review, your before and after photos are very helpful to actually see the BB creme on! Thanks. How does this compare to Snoe BB cream, which I recall you also liked?